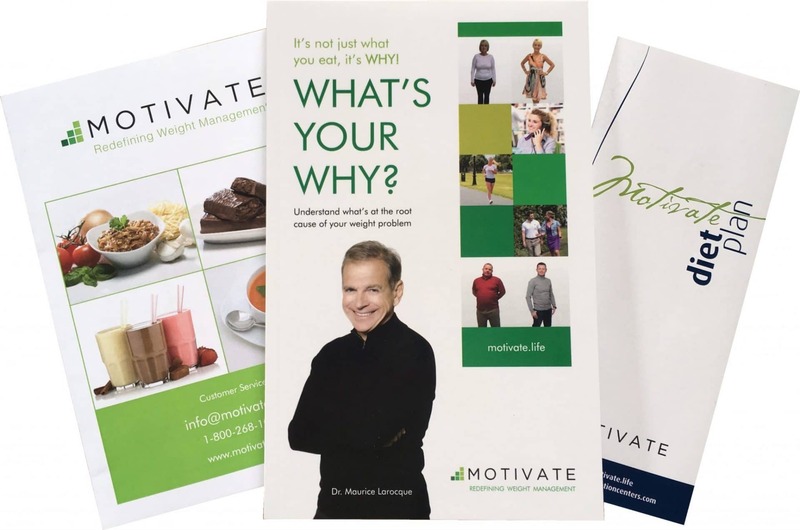 The Motivate Weight Loss program is a unique, well thought-out concept created and developed by Dr. Maurice Larocque, known worldwide for his research on treating obesity. Dr Larocque's 30 years of research and comparative studies have yielded inconclusive results which confirm that motivation plays a crucial role in weight loss. Therefore, the Motivation Weight Management Clinic make motivation their fundamental principle. Dieting, protein diets and other weight loss techniques actually work when motivation is maintained by a team of specialists. Motivation Weight Management's successful program is supported by a unique tool developed by Dr Larocque: the computerized questionnaire Mental Weight®. This questionnaire was designed to determine the diet that suits you and motivational tools based on your personality and your needs. Exercise, a healthy lifestyle, be motivated, these are all important elements to lose weight and stay slim. But to reduce your caloric intake resulting in weight loss, you should also have a very specific diet. Whether protein-based or not, your diet should be chosen according to your personality and tastes. A diet tailored to your needs. Our diet is a weight loss program that allows a quick weight loss while meeting your nutritional needs. Easy to follow, it can enjoy a variety of foods. When you decrease the number of calories to lose weight, your body automatically draws its fat to get energy. Unfortunately, it also taps into the muscle. During the first month of a total fast without charge, half the weight loss comes from muscle. The amount of protein a person needs to keep his muscles, his heart and his health is 0.8 grams per kilogram of ideal body weight. To prevent muscle wasting and maintain the elasticity of the skin during the slimming stage, the need is increased to 1.5 g per kilogram. As you can see, if you reduce calories, your protein needs double. If this protein requirement is not covered, follows muscle loss and heart (which is a muscle) thins. Many too low protein diets produce a slower metabolism. The result of these diets cause, when refuelling, a recovery of weight even if the person eats properly. Worse, each time she gained weight, she accumulates more fat than muscle. It becomes increasingly difficult to lose weight and easier to win. This is what is commonly called the yo-yo syndrome. It provides nitrogen balance in less than three weeks, that is to say a rapid weight loss while sparing your muscles. Since it is very low in carbohydrates (carbs), it causes a rapid decrease in insulin levels in the blood (because there is very little sugar to digest). So your cells burn fat more easily. Within three days, the body adapts to the decrease in calories and carbohydrates (carbs). So fat, used as an energy source, ensures the proper functioning of the body. It causes a decrease in appetite and a sense of well-being, state called the comfort zone. All normal activities can continue. Many people find it a source of motivation due to the loss of weight faster.